Holding her first grandchild in her arms in 2003, Mary Robinson was struck by the uncertainty of the world he had been born into. Before his fiftieth birthday, he would share the planet with more than nine billion people – people battling for food, water, and shelter in an increasingly volatile climate. The faceless, shadowy menace of climate change had become, in an instant, deeply personal. 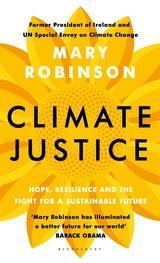 Mary Robinson's mission would lead her all over the world, from Malawi to Mongolia, and to a heartening revelation: that an irrepressible driving force in the battle for climate justice could be found at the grassroots level, mainly among women, many of them mothers and grandmothers like herself. From Sharon Hanshaw, the Mississippi matriarch whose campaign began in her East Biloxi hair salon and culminated in her speaking at the United Nations, to Constance Okollet, a small farmer who transformed the fortunes of her ailing community in rural Uganda, Robinson met with ordinary people whose resilience and ingenuity had already unlocked extraordinary change.